The Alerts section of the Executive Dashboard offers quick links to important reports. This alert detail is pulled from Classes > Wait List w/Openings. This alert does take future enrolls into account by showing the future enroll count and "adjusted" openings counts if your organization allows future enrollments. If the "adjusted" opening count is less than 1, it will appear yellow. This alert detail pulls from Clock > Incomplete Time Entries. If your organization tracks Absences, this alert detail pulls from Reports > Absences / Makeups. If your organization tracks Attendance, this alert detail is pulled from Reports > Attendance. The students must have 2-3 (or 4+) absences in the same class for them to be included in the Dashboard alert. However, when the alert links are clicked the resulting report will include ALL of the student's absences in the 14 or 30 day period. Example: If a student is absent once in Jazz within the last 14 days they will not appear on the Dashboard alert. If that student had also been absent from Tap twice in that time period they would show on the Dashboard and when the link was clicked to go to the report all 3 of the student's absences would be shown. If tracking attendance, keep in mind that this information is more of an attrition / retention value. The alert attempts to show the number of active students who have not attended in the last X days. This alert displays the number of classes that have passed their end date as a reminder to archive them. (Note: This alert does not include classes with no end date or classes with the current date as their end date.) Jackrabbit recommends you archive classes (instead of deleting them). To learn more about archiving see our Help article Archive Classes. Alert detail is pulled from Reports > Enroll History Report. 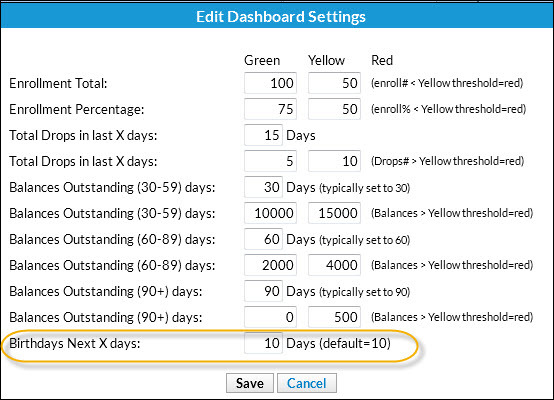 The number of days (X) in this report detail can be customized by updating the Dashboard setting. Dashboard settings may be changed by clicking the Settings link in the Aged Accounts or Key Metrics areas or by scrolling to the bottom of the Executive Dashboard and clicking Edit Dashboard Settings. Be sure to Save the change and click the Refresh Dashboard button. Pulled from Store > Reports > Report Type: Re-Order Alert Qty. This alert is regarding the previous day's classes (yesterday). With this you can address any attendance that was not completed by the instructor in the Staff Portal while it is still fresh in their minds! Click the link to go to the Incomplete Portal Attendance report for the previous day. For more information see our section of Help articles Attendance in the Staff Portal. The Scheduled Emails alert on the Executive Dashboard keeps you notified of pending scheduled emails and provides a link to the Scheduled Emails report where you can preview, edit, or cancel emails that have been scheduled to send later. For more details see our Help article Schedule an Email - Send Later.